Can we clone Judge Gleeson? Diaz will be sentenced in a few weeks, and when that happens I will carefully consider all the factors set forth in 18 U.S.C. § 3553(a) except one — the length of imprisonment recommended by the United States Sentencing Commission’s Guidelines Manual. Though I will not ignore Diaz’s Guidelines range, I will place almost no weight on it because of my fundamental policy disagreement with the offense guideline that produces it. In fairness to the government, I write here to explain my belief that the offense guideline for heroin, cocaine, and crack offenses (“drug trafficking offenses”) is deeply and structurally flawed. As a result, it produces ranges that are excessively severe across a broad range of cases, including this one. The Commission should use its resources, knowledge, and expertise to fashion fair sentencing ranges for drug trafficking offenses. If it does, those ranges will be substantially lower than the ranges produced by the current offense guideline. The deep, easily traceable structural flaw in the current drug trafficking offense guideline produces advisory ranges that are greater than necessary to comply with the purposes of sentencing. We must never lose sight of the fact that real people are at the receiving end of these sentences. Incarceration is often necessary, but the unnecessarily punitive extra months and years the drug trafficking offense guideline advises us to dish out matter: children grow up; loved ones drift away; employment opportunities fade; parents die. Is the Constitution a living document or is it "dead, dead, dead"? He and SMU law professor Bryan A. Garner shared the stage at McFarlin Auditorium for a lecture on their second book together, Reading Law: The Interpretation of Legal Text. He was sworn in today by Chief Judge Moreno. 2. The D.C. Circuit says no to recess appointments. It will be interesting to see how this plays out. The case will certainly go to the Supremes. Remember that a recess appointment was used with Judge Pryor, but he was eventually confirmed by the full Senate 53-45, so the case has no bearing on him. 3. Speaking of the 11th Circuit, Chief Judge Joel F. Dubina, will be the keynote speaker at a PBCBA membership luncheon on February 1 at 11:45 a.m. at the Marriott West Palm Beach. He will be speaking regarding the inner workings of the 11th Circuit and how things work behind the scenes. The luncheon will be co-hosted by the Palm Beach County Chapter of the Federal Bar Association and the Bankruptcy Bar Association for the Southern District of Florida. President George H.W. Bush appointed Chief Judge Dubina to the 11th Circuit in 1990 and he was appointed as Chief Judge in 2009. Judge Dubina previously served as a U.S. District Judge for the Middle District of Alabama from 1986-1990. He received his B.S. from the University of Alabama and his J.D. from Cumberland School of Law. Pre-registration for this luncheon is required and can be done on the Bar's website by clicking here. The point remained the same. Thomas was tossing a lighthearted barb during a discussion about the qualifications of some of the attorneys representing murder suspect Jonathan Boyer. One had attended Yale and one had attended Harvard. Thomas is a Yale Law grad who has been a frequent critic of his alma mater. On the other hand, he may have been making a crack about rival Harvard, because the lawyer from Cambridge was a man, and the New Haven graduate was a woman. Maybe the joke was directed at the entire Ivy League, a favorite Thomas target. Every member of the high court attended Yale or Harvard, although Justice Ruth Bader Ginsburg finished at Columbia. Chief Judge Joel Dubina of the U.S Court of Appeals for the Eleventh Circuit will step down as chief on August 1, Dubina told the Daily Report this week. Dubina, who maintains his primary chambers in Montgomery, Ala., has been chief judge since mid-2009. He said the next chief judge will be Edward Carnes, a Montgomery-based judge who is next in line by seniority. Dubina said he was leaning towards taking senior status—a form of semi-retirement in which judges can work a lighter caseload—in August, as well, but he didn’t commit to doing so. “I have not sent a letter to the president yet about senior status, and I have not definitively made up my mind about that,” he said. UPDATE -- Everything you want to know about the Supreme Court Skullcaps (worn yesterday by Justices Scalia and Breyer) is here. 1. Judge Scola did the right and courageous thing by granting the defense's motion for judgment of acquittal in Izhar Khan's case. Here is the JOA ruling. The money line: "This court will not allow the sins of the father to be visited upon the son." And here is Curt Anderson's coverage. 2. Clarence Thomas spoke during an oral argument. No one is really sure what he said. Here's the audio so you can hear for yourself. 4. The Supreme Court weighed in on houseboats. Lozman's was a house and not a boat. Convicted on eight counts, including two civil rights violations, conspiracy to possess and possession with the intent to distribute cocaine and crack cocaine, obstruction of justice and making false official statements. For one of the defendants, Izhar Khan. He was represented by Joe Rosenbaum, Dore Louis, and Kim Acevedo. Congrats to the defense team. This is the second of three defendants to be dismissed from the case. The first was represented by Michael Caruso, the FPD. Also congrats to Judge Scola for having the courage to issue this ruling. acquittal for the 26-year-old Muslim scholar. younger imam, imam of Masjid Jamaat Al-Mumineen mosque off Sample Road. forward against Izhar Khan,” Scola ruled Thursday. That's the question for the jury today in the case of Raul Iglesias, the Miami police officer on trial for allegedly planting evidence. The prosecution has called the witnesses heroes and the defense has called them liars. I know this was a hard fought battle between Rick Diaz for the defense and Rick Del Toro and Michael Berger for the prosecution, in a case where the defendant testified. “We had four eyewitnesses — police officers who stood up to corruption, who stood up to what was wrong,” Assistant U.S. Attorney Ricardo Del Toro told the 12-member jury during closing arguments Wednesday. On Wednesday, his defense attorney, Rick Diaz, argued that none of the four detectives in Iglesias’ unit testified that they ever witnessed him stealing drugs seized from street dealers, and only one claimed he saw the supervisor swipe money confiscated from a trafficker in April 2010. Diaz said that detective’s testimony was a lie, pointing out that the dealer testified at trial that he had no money on him. Diaz told jurors that an anonymous letter was sent on April 13, 2010, to Miami police’s Internal Affairs, claiming Iglesias stole drugs and money from dealers two to three times a week over a four-month period. He said it was written by detectives seeking revenge against their new boss because he was trying to tame the “undisciplined” squad and transfer a few officers. Diaz strived to portray Iglesias, an 18-year police veteran who served with the Marines in the Iraq War, as a man of character who deserved to be acquitted on all nine counts. A houseboat is a house! So says the High Court (at least in this case) in a nice win for local Fane Lozman in: Lozman v. Riviera Beach. Prior blog coverage here. Lozman was pro se in the district court case here in the SDFLA, but ended up being represented by a number of high powered lawyers, including Jeffrey Fischer. Casting aside the simplistic notion that “anything that floats” is a watercraft whose use and activity is controlled by maritime law, the Supreme Court on Tuesday installed a “reasonable observer” at dockside to make the judgment about whether a floating structure qualifies, or not, as a “vessel.” The vote was seven to two, in favor of a maverick Florida owner of a houseboat who was constantly in hot water with marina owners, but now appears to have the last word: the marina probably will have to pay him, not the other way around. The dissenters complained that the Court was introducing confusion and complexity into what should be straightforward and explicit, and thus upsetting the expectations of the entire maritime industry. The majority, in an opinion by Justice Stephen G. Breyer, insisted that its “reasonable observer” test would work in the real world of floating structures. While this case turned on a boxy two-story floating home that Fane Lozman had lived in at various marinas in Florida, the Court treated his case (Lozman v. Riviera Beach, 11-626) as one with considerably wider impact on maritime law. What came out of it, in the end, was a reliance upon the traditional legal figure of the “reasonable man” (to be politically correct, now the “reasonable observer”) to make a common-sense assessment of the physical characteristics and activities of a floating structure, and then decide whether it was meant to be a vehicle of water transportation. Courts, of course, will be deciding what the “reasonable observer” would see, presumably on a case-by-case basis. Under this test, not all houseboats will be exempt from maritime regulation, since many of them have motors to propel them, so a reasonable view of them is likely to be that they can be moved over water, carrying goods and people. But neither will all dockside structures used as homes, and ill-fitted for gliding over the waves, come under the new definition, because they probably will not be seen as transport vessels. It may take some time, and quite a bit of litigation, to see the difference between them, and between other floating structures. 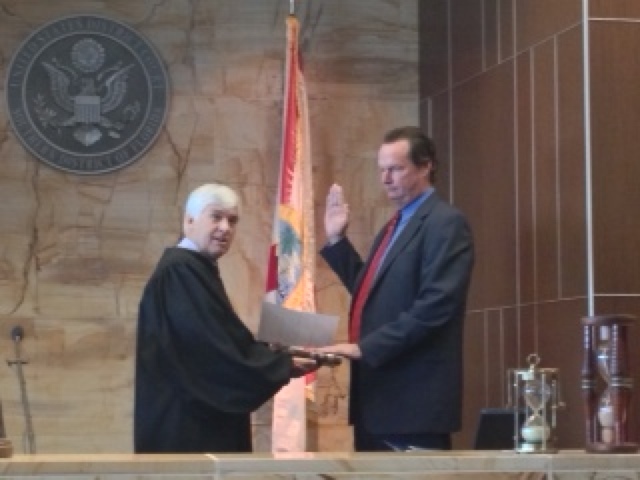 The Judicial Conference of the United States has authorized the appointment of a full-time United States Magistrate Judge for the Southern District of Florida at Fort Lauderdale. Due to space limitations and other considerations, the appointee will likely have chambers and case assignments in both Fort Lauderdale and Miami. This appointment will succeed the incumbent who will be retiring on or about January 27, 2013. Merit Selection panel composed of attorneys and other members of the community will review all applicants and recommend to the judges of the district court, in confidence, the names of at least five applicants for the position whose character, experience, ability and commitment to equal justice under law fully qualify them to serve as a United States magistrate judge. The Court will make the appointment, following an FBI full-field investigation and an IRS tax check of the appointee. An affirmative effort will be made to give due consideration to all qualified candidates, including women and members of minority groups. The current annual salary for the position is $160,080.00. The term of office is eight years. All applicants are expected to review Administrative Order 2011-50, in re: Procedures Governing Contact with District Judges During Magistrate Judge Merit Selection Process. All applications will be kept confidential, unless the applicant consents to disclosure, and all applications will be examined only by members of the Merit Selection Panel and the judges of the district court. The panel’s deliberations will remain confidential. Instructions for completion and submission of the application are included on each application form. Completed applications must be received by 5:00 p.m. on February 8, 2013. JUSTICE SCALIA: She was a graduate of Yale law school, wasn’t she? MS. SIGLER: She’s a very impressive attorney. JUSTICE SCALIA: And another of his counsel, Mr. Singer — of the three that he had — he was a graduate of Harvard law school, wasn’t he? MS. SIGLER: Yes, Your Honor. MS. SIGLER: I would refute that, Justice Thomas. JUSTICE SOTOMAYOR: Counsel, do you want to define constitutionally adequate counsel? Is it anybody who’s graduated from Harvard and Yale? JUSTICE SOTOMAYOR: Or even just passed the Bar? MS. SIGLER: Or LSU law. Here is the Above the Law coverage, which has the whole story. “No one has done anything illegal or broke the law." Later in their chat, Asanza — who was cooperating with authorities and trying to bait his boss into incriminating statements — expressed fears about lying on the witness stand if he was asked to testify. Iglesias agreed that committing perjury would be a bad idea. “Yeah, of course, you don’t wanna, you don’t wanna f---ing lie,’’ Iglesias responded. The secret tape recording from June 2010 was the last piece of evidence that prosecutors presented before resting their corruption case Friday against Iglesias, 40, who has been on the force for 18 years. Iglesias, an ex-Marine and Iraq War veteran who was shot in the leg during a 2004 drug bust, is standing trial on charges of planting cocaine on a suspect, stealing drugs and money from dope dealers, and lying to investigators about a box of money left in an abandoned car as part of an FBI sting. Asanza, 33, also an ex-Marine, pleaded guilty last year to a misdemeanor charge of possessing cocaine and marijuana. The deal helped him avoid a felony conviction; in exchange, he testified Thursday that Iglesias told him it was “okay” to pay off confidential informants with drugs. The secret tape recording could cut both ways for jurors. On it, Iglesias did not say anything to Asanza to implicate himself in connection with charges in the nine-count indictment, his defense attorney, Rick Diaz, pointed out Friday. The charges encompass the police sergeant’s brief stint as head of the Crime Supression Unit from January to May 2010. Should be interesting to see how this thing ends. At least nine Miami police officers are expected to face federal criminal charges or internal discipline from a broadening FBI investigation into a suspected protection scheme involving a Liberty City gambling ring and other criminal activity, The Miami Herald has learned. Six of those officers have already resigned or been relieved of duty in recent weeks in connection with the investigation, according to sources close to the probe. The FBI, working with Miami police internal affairs investigators, is expected to make arrests before the end of the month. The officers, who worked in the Model City substation, are suspected of providing off-the-books protection to a Liberty City barber shop that served as a front for an illegal sports-betting operation busted last March. Officers frequented the barber shop so often that one gambler told county police he thought the place was being run by the Miami Police Department, court records show. Generally in our legal system, the buck stops at the Supreme Court, but these statistics (here is the underlying data) confirm that it's almost impossible to get cert granted. Your chances last year, if you filed a cert petition, were less than 1%! And the year before that, just over 1%. "[The Eleventh Circuit] does not seem to be listening [to the Supreme Court]." A few days after Christmas, a divided three-judge panel of the court ruled that Ronald B. Smith, a death row inmate in Alabama, could not pursue a challenge to his conviction and sentence because he had not “properly filed” a document by a certain deadline. As it happens, there is no dispute that the document was filed on time. But it was not “properly filed,” the majority said, because Mr. Smith’s lawyer did not at the same time pay the $154 filing fee or file a motion to establish something also not in dispute — that his client was indigent. Nor did the majority place much weight on the fact that the lawyer himself was on probation for public intoxication and was addicted to crystal methamphetamine while he was being less than punctilious. In the months that followed, the lawyer would be charged with drug possession, declare bankruptcy and commit suicide. Judge Rosemary Barkett dissented, saying she did not see how the case was materially different from that of Mr. Maples or a 2010 rebuke from the Supreme Court to her court. In that second case, a Florida death row inmate named Albert Holland was given a new opportunity to argue that his lawyer’s inaccessibility and incompetence had caused him to miss a deadline. In a concurrence in April in yet another blown-deadline case, Judge Barkett identified the larger question that runs through these cases: why is it morally permissible to blame clients for their lawyers’ mistakes? The legal system generally answers by saying that lawyers are their clients’ agents. The answer makes perfect sense when you are talking about sophisticated clients who choose their lawyers, supervise their work and fire them if they turn out to be incompetent or worse. But the theory turns problematic, Judge Barkett wrote, when the clients are on death row, have no role in the selection of their lawyers and have no real control over them. It’s hard to say which fan has more bragging rights, but one thing is abundantly clear: Moreno’s cavernous chambers on the 12th floor of the ship-shaped federal courthouse in downtown Miami is like a shrine to his alma mater. The 1993 movie is about Rudy’s 27 seconds of fame during his one-game career as a fifth-string Fighting Irish defensive end. He beat all the odds to get into Notre Dame and onto the football team — thanks, in part, to Moreno. The pair lived in adjacent dorm rooms in 1973 and ’74, while Moreno attended Notre Dame and Rudy was going to a nearby junior college, Holy Cross. Moreno, who majored in government and international relations, tutored Rudy in math, English and Spanish. Rudy was eventually admitted into Notre Dame, and the rest is history. In the movie, Hollywood took some artistic license with Rudy’s script and portrayed the “tutor” on the big screen as a nerd who wore two watches and depended on Rudy to get him dates. I particularly like the plaque in Judge Moreno's chambers that says: "Judge like a Champion today." The Justices agreed to hear an appeal by the federal government in United States v. Davila (12-167), testing what the remedy is to be in a plea-bargained criminal case when a federal judge had some role leading up to agreement on the plea deal. The Eleventh Circuit Court ruled that, if the judge (in this case, a magistrate judge) has any role whatsoever in the plea talks, the guilty plea that resulted must be thrown out. The government petition argued that the guilty plea should be overturned only if the judge’s participation had resulted in prejudice to the accused. Detectives Suberto Hernandez and Luis Valdes told jurors that Iglesias asked the pair if they had any “throw-down dope” to plant on a drug suspect after a search of the man during a Jan. 27, 2010, surveillance operation turned up no drugs. Iglesias, 40, is on trial facing nine counts of conspiracy to possess cocaine, violating suspects’ civil rights, obstruction of justice and making false statements. The charges stem from what federal prosecutors have described as four separate incidents of misconduct over a four-month period in 2010, when Iglesias led a team in the police department’s Crime Suppression Unit, which targets street-level drug sales. ***But under cross-examination from Iglesias’ lawyer, Rick Diaz, Valdes conceded that he did not see Martinez hand the drugs to Iglesias. Nor did he see Iglesias plant the baggie on Rafael Hernandez. Iglesias told the detectives he found the drugs in the back pocket of Rafael Hernandez’s jeans — though neither detective saw Iglesias search the suspect. Diaz challenged the detectives’ stories and suggested that Iglesias simply found evidence that Detective Hernandez had overlooked. The lawyer questioned how thorough Hernandez was in his search, noting that, in a case in 2004, the detective had failed to find drugs on a suspect who was later found to be carrying them. And in an interview with Internal Affairs detectives and an FBI agent in May 2010, Diaz told the jury, Detective Hernandez described his search of the suspect as merely a “pat down” — a less intrusive type of search that does not include searching the contents of a suspect’s pockets. Valdes and Hernandez also said they once saw a bag of what appeared to be crack cocaine in a military-style bag that Iglesias owned. They said the bag was not marked as evidence or part of a police-issued “sting kit” used when officers pretend to be drug dealers in reverse stings. But Diaz argued that the bag may have contained “sham” drugs or household items that merely looked like drugs. If the detectives thought Iglesias was carrying illegal drugs or planting evidence, Diaz asked, then why didn’t the officers complain to their superiors, or even arrest Iglesias? ...But the nearly universal recognition that this gesture is an insult deprives such an interpretation of reasonableness." An irate automobile passenger’s act of “giving the finger,” a gesture of insult known for centuries,1 to a policeman has led to a seizure of two persons ordered to return to an automobile, an arrest for disorderly conduct, a civil rights suit, and now this appeal. Plaintiffs-Appellants John Swartz (“John”) and his wife, Judy Mayton-Swartz (“Judy”), appeal the July 8, 2011, judgment of the United States District Court for the Northern District of New York (David N. Hurd, District Judge) granting summary judgment to Defendants-Appellees Richard Insogna, a St. Johnsville, New York, police officer, and Kevin Collins, an officer with the Montgomery, New York, Sheriff’s Department. Accepting, as we must at this stage of the litigation, the Plaintiffs’ version of the facts, we vacate the judgment and remand for further proceedings. I like footnote 1: See Bad Frog Brewery, Inc. v. New York State Liquor Authority, 134 F.3d 87, 91 n.1 (2d Cir. 1998) (reporting the use of the gesture by Diogenes to insult Demosthenes). Even earlier, Strepsiades was portrayed by Aristophanes as extending the middle finger to insult Aristotle. See Aristophanes, The Clouds (W. Arrowsmith, trans., Running Press (1962)). Possibly the first recorded use of the gesture in the United States occurred in 1886 when a joint baseball team photograph of the Boston Beaneaters and the New York Giants showed a Boston pitcher giving the finger to the Giants. See Ira P. Robbins, Digitus Impudicus: The Middle Finger and the Law , 41 U.C. Davis L. Rev. 1403, 1415 (2008). There is usually no mistaking the act or intent of extending a middle finger. John Swartz was arrested in May 2006 after he raised his middle finger upon spotting a police radar device in St. Johnsville, N.Y. An officer says he thought Mr. Swartz might be seeking help. Take John Swartz, for example. In May 2006, Mr. Swartz was a passenger in a car in a rural part of upstate New York when he spotted a police car that was using a radar speed-tracking device. Mr. Swartz, a Vietnam veteran and retired airline pilot, acted on instinct to show his displeasure: he extended his right arm outside the passenger’s side window, and then further extended his middle finger over the car’s roof. He later filed a civil rights lawsuit, and although a lower court judge dismissed the case, the prestigious United States Court of Appeals for the Second Circuit in Manhattan reversed that decision on Thursday, ruling that Mr. Swartz’s lawsuit can go forward. Mr. Swartz’s intent, 120 years later, was undoubtedly similar. He made the gesture as his fiancée and now wife, Judy Swartz, was driving on the Sunday evening before Memorial Day through St. Johnsville, a village of under 2,000 people, about 50 miles northwest of Albany. “I couldn’t see the officer, didn’t know who he was,” Mr. Swartz, 62, recalled on Thursday. He explained that his gesture was provoked by his anger that the local police were spending their time running a speed trap instead of patrolling and solving crimes. Yesterday the Pakistani Taliban trial started. And today, Judge Altonaga starts a trial with "a Miami police sergeant charged with planting cocaine on a suspect and stealing drugs and money from dealers." In the sergeant's corner is Rick Diaz. The government is represented by Rick Del Toro. The Herald has more. Next month, Kim Rothstein is set to plead guilty to a 371 conspiracy count. I feel bad for her, especially if it was her husband who ratted her out. The Sun-Sentinal has the coverage. Life in this District is never boring! Out of the frying pan; into the fire. That's what Judge Scola must be thinking after just finishing a very lengthy B-girls trial to end 2012, and now starting the Pakistani Taliban trial to begin 2013. When the high-profile trial of two South Florida religious leaders accused of sending cash to help the Pakistani Taliban begins Wednesday, their defense is expected to argue they were simply offering charity to family and friends in their troubled homeland. Izhar Khan, 26, was the young imam at a Margate mosque; his father, Hafiz Khan, 77, led a Miami mosque until they were arrested in May 2011 on federal charges they sent cash to the terrorist organization. The men, both U.S. citizens born in Pakistan, are charged with funneling $50,000 from South Florida to the Taliban between 2008 and 2010. Prosecutors used more than 1,000 wiretapped phone calls, bank records and a confidential informant to make their case. The case hinges on whether jurors believe the men conspired to help terrorists who target U.S. and Pakistani interests. The Taliban has been linked to al-Qaida and had a role in the failed attempt to bomb New York's Times Square in May 2010 and other attacks, experts say. Defense attorneys say the men's motives were misinterpreted and the money was for family members affected by violence in the Swat Valley in northwest Pakistan. The money was also to help a school for boys and girls, established long ago by the elder man in his hometown, the defense said. Both men pleaded not guilty and have been locked up since their arrests. The trial in federal court in Miami is expected to take several weeks. Jury selection is expected to take a few days. U.S. District Judge Robert Scola Jr. said dozens of potential jurors will fill out questionnaires before he asks about their attitudes toward Islam, terrorism and other possible biases. Though Hafiz Khan looks frail and confused and comes to court in a wheelchair the judge ruled he was mentally competent for trial and there was evidence he exaggerated some memory problems. At prosecutors' request, jurors shouldn't see the wheelchair, which federal marshals said is used only for convenience to move him quickly from his cell to court. Izhar Khan was a popular, soft-spoken leader at Margate's moderate Masjid Jamaat Al-Mumineen mosque off Sample Road, congregation members said. The young man reserved his fervor for basketball and cricket, supporters said. They said he was known for preaching tolerance of other religions and his in-depth religious knowledge. He lived in the U.S. since age 8, records show. 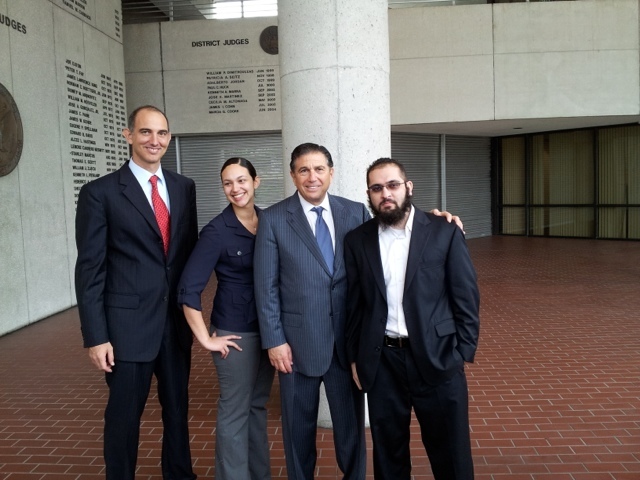 The courtroom will be missing Federal Defender Michael Caruso, whose client was dismissed from the case months ago. The case starts today in violation of Rumpole's trial rule #4 -- never try a case in January.